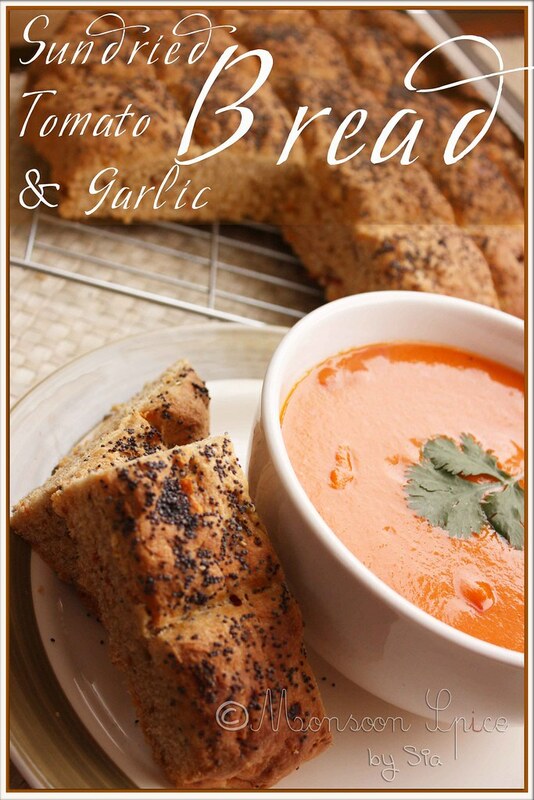 Monsoon Spice | Unveil the Magic of Spices...: Sun Dried Tomato & Garlic Flavoured Whole Wheat Bread: From Baking Virgin!!! Sun Dried Tomato & Garlic Flavoured Whole Wheat Bread: From Baking Virgin!!! “Lady, you have been staring at me since last fifteen minute”, said handsome fellow with twinkle in his eyes. “No I am not!” I said indignantly. “Oh yes, you are. I am quite sure of it”. He was amused. “Excuse me! You are imagining things”, I said trying to avoid his eyes. “Its not the first time I noticed you looking at me ‘that’ way you know. I think I know what you want”, he said looking deep into my eyes. “Oh, really? So you think you can read my mind? Tell me what’s in mind?” I challenged him as I was quite sure that he was bluffing. And that’s exactly what I wanted to do all these years even when I was kitchen virgin! And at last I am happy to announce that I am no more a virgin, ahem, baking virgin is what I meant!!! Ta-da… I baked bread!!! I did it!!! And how I did it!!! I decided to stick with whole wheat and ditched the thought of using plain flour as I find the whole wheat flavour to be more to my liking and quite earthy. I decided to flavour my bread with sun dried tomatoes (as I had this bottled sun dried tomatoes nearing its expiry date), garlic (can’t get enough of it) and some dried Italian herbs. Since I was baking it for lunch of big bowls of Roasted Pepper & Tomato Soup, and since I also happen to love the flavour of olive oil in breads, I used good amount of extra virgin olive oil. So the end product is Sun Dried Tomato & Garlic flavoured Whole Wheat Bread. I wanted my bread to be pretty basic and rustic looking, something that I buy from farmer’s market every weekend. 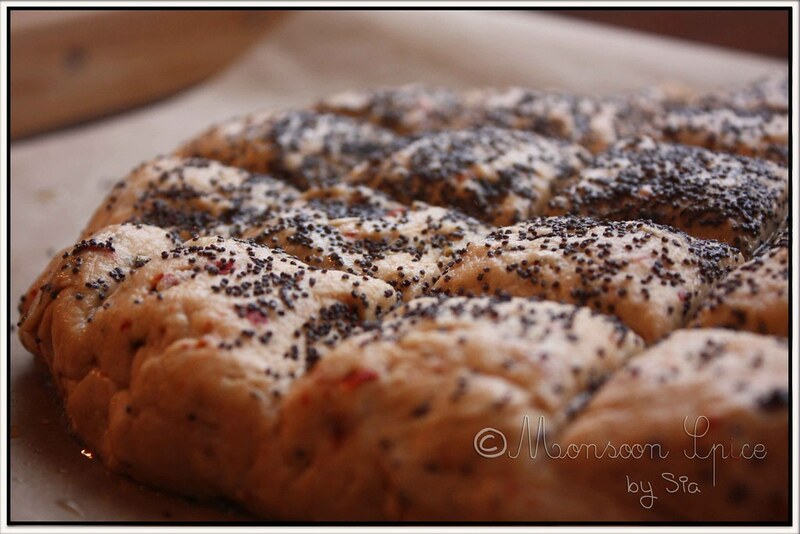 So I shaped it into rough circle and made few incisions with knife and sprinkled generous poppy seeds on top of it. After few minutes of baking in my ancient oven, my kitchen smelled like bread shop that made us twice hungry! The upper crust was golden brown and little hard and the inside was spongy and well, bread-y ;) It’s a miracle we didn’t start tearing it off as soon as it came out of oven and stuff our mouth with freshly baked goodness! And boy!!! Did I master him or what! Mix dry yeast in warm milk and keep it aside for 10 mins, by when the yeast would have started to react and bubbled. Sieve whole wheat flour, baking powder and salt to taste in a large mixing bowl. Mix in chopped sun dried tomatoes, Italian herb mix and crushed garlic. Make small hole in the centre and add yeast dissolved in milk along with olive oil and start to mix them well. Slowly start adding water as and when needed and form smooth, pliable dough. Cover the dough with cling film and let it rest for minimum 1½ hours till the dough starts to rise and doubles in volume. Preheat the oven at 220 degree C.
Line parchment paper on baking tray and spray it with oil. Gently transfer the dough into centre of baking tray and shape it either square or rectangle or circle as I have done here. Using a large knife, lightly press the surface horizontally and vertically forming squares. Brush the surface with 1-2 tbsp of extra virgin olive oil, coating the top surface well and sprinkle poppy seeds or topping of your choice. Place the baking tray in mid rack and bake it undisturbed for 35-45 mins depending on the type of oven. The bread should be backed well and the surface should turn golden brown in colour. Place the backed bread on cooling rack and let it cool for 15 mins before cutting them into desired shape. When tapped, the bread should produce hollow sound which assures that the bread is baked well. 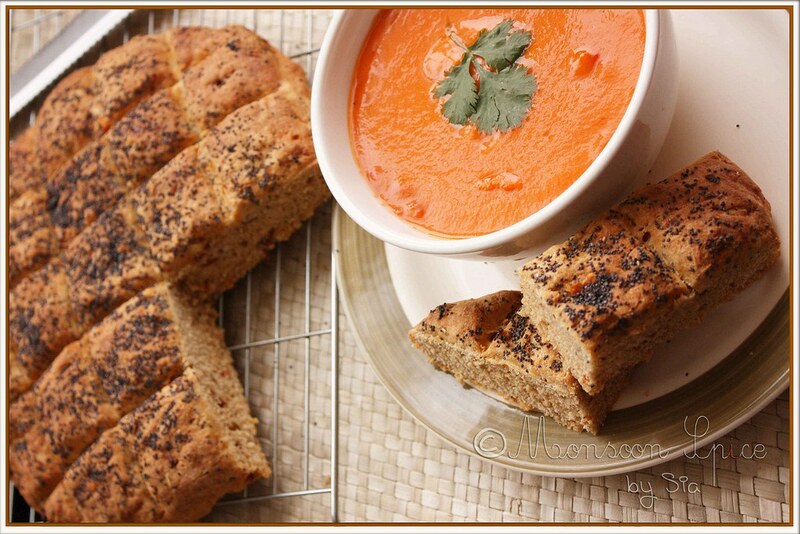 Cut bread into desired shapes and serve as it is or with hot bowl of your favourite soup and enjoy! OMG that looks really great....Loved the diamond marks on top..
Sia, this bread looks gorgeous. Can't believe you were a baking virgin. Kudos! So when are you joining the daring bakers'? Love the rustic look of the bread. Bread with that bowl of soup makes a great combo. I always love reading the begning of your post, it is always so hilarious. The bread looks so good, i love the marks on top, it gives a real rustic look. oooh boy!! he is a handsome devil, to be sure ;) !! That guy looks really handsome, no wonder you wanted to master him..and to think of it you created this hunk all by urself..ha that's awesome baking goddess. I am yet to master putting anything in my damn oven other than frozen food...Wish one day I will be able to bake like u...sigh!! Wow, Sia! Baking bread right from scratch and that too without following any recipe! That's great. I have still not ventured into baking with yeast. Will do it sometime soon. The bread looks perfect and the flavors you have added are so good too. The sun dried tomatoes and garlic's pungent smell should have made this more aromatic!!! looks soft and flavorful too!!! Oh Sia, the flavors are all my favorite and serving it with a creamy tomato soup would take me to heaven. Virginity ? ahaha...thats a nice comparison. And I love this loaf. Yes! It was SHOCK to see B'lore after 18yrs! It's a concrete jungle now, more like Bombay than a beautiful tree lined streets before. Where are they? Don't know what to feel, happy or sad! Yeah! First day, we went to Commercial street to see my beauty school(Susheela Vaswani's) where I got my diploma, couldn't find it! But shopped at Westside for Kurtis and ate and had fun. Wrong time to go, should have gone in December, will do next time. Parents are in Kengeri Satellite town, beautiful house with marble floor! Ok before you grind ur teeth and search for some thing to hit me, let me calm you down by praising you, saying that this bread looks more delicious, overwhelmingly flavorful, and a healthier option, than the one we buy from baker next to our home. Inspired from you, I did my very first baking today. lol...that looks really good! Wonderful flavours. Beautiful combo of soup and bread! That guy is really handsome. ;) Pics are good as ever. i want to ask u which blender/mixer u r using ? I want to ask you which blender /mixer u r using right now? u sure showed him who's boss! Lovely bread. This looks really lovely! I totally enjoy making bread! Aww... u lovely ladies know how to make my day! :) Thanks girls. I never dreamt of saying this. listen girls, baking is not that difficult! trust me and try some easy recipes like Biscotti. 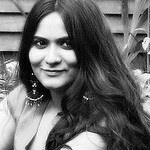 @Poonam, I have panasonic mixer grinder which I bought from India. its a heavy duty mixer grinder like sumeet, preeti etc and i use it for gring dosa and idli batter and all sorts of spice powders. Wow sundried tomato and garlic! 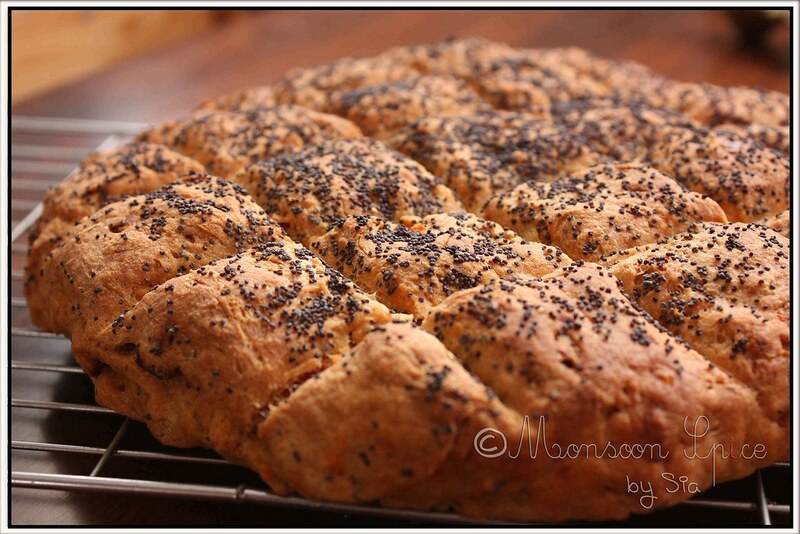 !The name itself is making me drool..Perfect bread with lovely topping of black peppercorns. I always like ur small little funny stories. I love anything made with whole wheat!! So we can see more 'n more bread here? Handsome bread:-P.The addition of garlic and sun dried tomatoes makes it all the more tempting! Hi Sia! Glad to see that you have mastered bread baking on your maiden voyage! Looks super delicous - I'd want to read out and take a bite! The bread looks awesome ! Thats a pretty fabulous attempt. Pics are so inviting. The writeup was funny, inspiring and tempting. Wow. Cheers!